Russia and Chile should broaden close cooperation in all respects year by year. This is the opinion of Michail Orlovets, the Ambassador Extraordinary and Plenipotentiary of the Russian Federation to Chile. In his interview to our journal he told us about political, trade, economic, and cultural aspects of cooperation, and also gave useful advice to Russian entrepreneurs. - The Embassy of the Russian Federation is working at strengthening friendly relations between Moscow and Santiago. How could you evaluate the current conditions and prospects of the Russian-Chilean relations? In what aspects are the bilateral relations the most promising? - At present we are trying to transfer the Russian-Chilean relations onto the up-to-date platform meeting the demands of both countries; we are also developing political contacts and improving contractual and legal basis. I would like to particularly emphasize the Treaty on Partners’ Relations which was signed in November 2010 at the meeting of both presidents at the summit of APEC in Japan. The treaty fixed fundamental principles and directions of our cooperation: strengthening universe peace and security, ensuring just and fair world, observance of human rights, respect for political and economic independence of states, and affirmation of democratic values. The State Duma ratified this document on May 15. We are looking forward to the same actions from the Chilean party. Nowadays meetings at different levels are actively being prepared and held before the Asia-Pacific Economic Cooperation (APEC) forum under the chairmanship of the Russian Federation; President of Chile Sebastian Pinera participated in the summit in Vladivostok in September. Negotiations with the Chilean party show considerable coincidence of the two countries on such important issues as affirmation of the multipolar world, the central role of the U.N.O., the refinement of the international financial architecture, etc. - What can you say about trade and economic relations between our countries? Are there any factors complicating the bilateral trade? How severe is the competition for Russia on the Chilean market and who are the rivals? 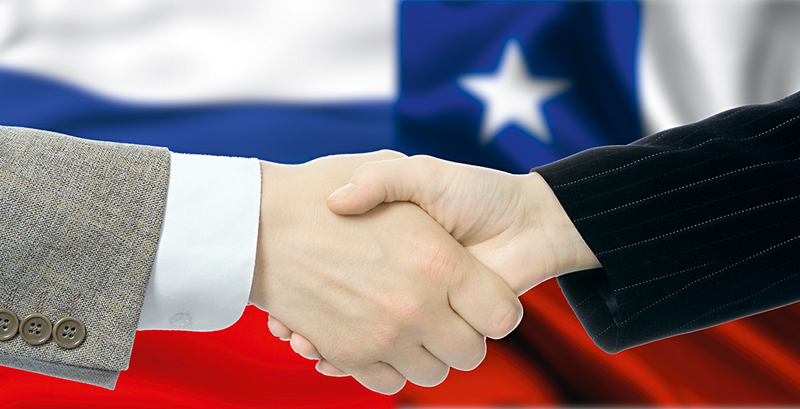 - The total volume of the Russian-Chilean bilateral trade at the moment comes at $450m. Of course, it does not correspond to the potential of the Russian Federation and Chile, especially if a high degree of complementarity of the countries being taken into account. Even with such modest characteristics the situation is not in the Russian party’s favour. We should give credit to the Chilean eagerness to actively develop new markets for their competitive goods, among which the Russian market is one of the most promising. On the other hand, we forward Russian trade and economic relations in Chile both along state and private channels. This April the 6th Meeting of Intergovernmental Russian-Chilean Commission on Trade and Economic Cooperation took place. Simultaneously with this a bilateral business-forum with participation of commercial companies interested in work on the Chilean market was held. Among the companies are the “Power Machines” company, PC “RusHydro”, “SouzSpecStroy”, PC “OZК” and many others. A representative Russian delegation took an active part in the international air-space exhibition FIDAE-2012 which was held in Chile at the end of March-beginning April. In general, Chilean public get interested in cooperation with Russia in such fields as mining industry, telecommunications, grain purchasing, energy, and digital technologies. However, one should keep in mind that historically this country is oriented to a certain extent towards equipment and technologies from North America, Europe, Japan, and South Korea and China in the latest years. That’s why “to make one’s way” there has to be done under the conditions of cut-throat competition. To work more efficiently some of the Russian companies, e.g. “Power Machines” opened their representative offices in Chile that enables them to negotiate effectively with Chilean contractors under the conditions of mutual cooperation. - Entrepreneurs from Russia are very cautious in their commentaries concerning their possibility of going into more active business in Chile. One of the valid objections to it is the country’s geographic remoteness and traditionally strong positions of historic partners of Santiago. What possible means of Russian business assistance to the Chilean market entry do you see? - Among obstacles which Russian businesses face on the Chilean market one should mention the main problem of a universal character. We live at the time of total globalization, a high degree of mutual penetration of goods and services, where geographic market remoteness does not play a key role. To overcome this, entrepreneurs should have a high level of education, profound knowledge of foreign languages, skills in negotiating, aiming at long-term perspectives, not at momentary profit. Unfortunately, not all Russian businessmen are ready to work under such conditions. But this is a matter of time. We are learning quickly. I would like to advise Russian companies who want to work on the Chilean market to use their tools more intensely, and first of all information tools. This may be chambers of commerce and industry, the Russian-Chilean business council, the representative office “ProChile” in Moscow, and certainly the Internet resources thanks to which one can find a potential partner and make oneself known. - How actively are Russia and Chile developing relations in other areas? What bright and prominent events in the cultural sphere can you tell our readers about? - Among positive examples it should be noted the agreement on cooperation between parliamentarian upper chambers, which was signed in June 2011 by the chairman of the Chilean Senate during his visit to Moscow. I hope these optional opportunities will be used to develop our relations in various spheres, e.g. in trade and economic ones. Days of St. Petersburg which were organized by the city’s government with the help of our embassy and were held in Santiago last November became a significant event in the cultural sphere. Chileans still well remember performances of musicians of the Mariinsky Theatre. At the same time two Russian exhibition were organized: the exhibition of modern St. Petersburg’s artists “History and Culture of St. Petersburg in Graphic Drawings” and photo exhibition from the collections of the Museum of Anthropology and Ethnography named after Peter the Great which was called “M.V. Lomonosov and his époque” and was dedicated to 300th birth date of the prominent Russian scientist. Russian composer Igor Rogalyov conducted a master class in the conservatoire of Mayor University. Apart from this, in Chile one could visit tours of ballet dancers from the Mariinsky and Bolshoi Theatre which were called “Stars of the Russian Ballet”, solo concerts of Russian musicians who live in Chile, meetings with singers-participants of the opera “Boris Godunov” staged in the Municipal Theatre of Santiago, and performances of other Russians groups. That June Santiago was home to the exhibition of the Russian artist Boris Grigoryev from the Russian museum collection of St. Petersburg and collections from private museums of Germany and Chile. It was a great success among general public who showed a keen interest in it. In short, the agenda of the Russian-Chilean relations includes enhancement in all aspects. It is necessary to continue enlargement and modernization of contractual and legal basis, to force signed agreements to work, to expedite harmonization of projects of new documents, on scientific and technical cooperation in particular, in the field of education and in a number of other issues of mutual interest. We are ready to realize current arrangements and find new prospective spheres of our mutual cooperation.